The results of exercise training can be positive or negative depending on how the stressors are applied. Fry et al. (1991), Kuipers (1998) and Rowbottom et al. (1998) suggest that training is related to fitness goals and athletic performance on a continuum that is best described as an inverted U (Figure 1). At one end of the continuum are individuals who are undertrained and whose fitness level and performance abilities are determined by genetics, disease, and non-exercise lifestyle choices. Individuals whose training programmes lack sufficient volume, intensity, or progression for either improvement or maintenance of fitness or performance are also undertrained. The goal of optimal training is the attainment of peak fitness and/or performance. However, if the training overload is too much or improperly applied, then maladaptation may occur. The first step toward maladaptation may be overreaching, a short-term decrease in performance capacity that is easily recovered from and generally lasts from a few days to two weeks. Overreaching may result from planned shock micro-cycles, as described in the periodisation section, or result inadvertently from too much stress and too little planned recovery (Fry et al., 1991; Fry & Kraemer, 1997; Kuipers, 1998). If overreaching is planned and subsequent recovery is sufficient, positive adaptation and improved performance, sometimes called supercompensation, result. If, however, overreaching is left unchecked or the individual or fitness professional interprets the decrease in performance as an indication that more work must be done, overreaching may develop into overtraining. Overtraining, correctly termed the overtraining syndrome, is a state of chronic decrease in performance and the ability to train, where recovery may take several weeks, months, or even years (Fry et al., 1991; Fry & Kraemer, 1997; Kreider et al., 1998; Armstrong & van Heest, 2002). Understanding stress enhances our understanding of exercise, training, physical fitness and recovery. As emphasised previously, both acute exercise and chronic training are stressors. Thus, from this viewpoint, physical fitness may be defined as achieved adaptation to the stress imposed by muscular exercise. 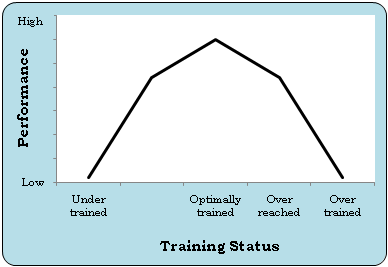 It results as an adaptation from a correctly applied training programme, is usually exhibited in response to an acute exercise task and implies avoidance of the overtraining syndrome. Fry, R.W., Morton, A.R. & Keast, D (1991) Overtraining in Athletes: An Update. Sports Medicine. 12(1), pp.32-65. Kuipers, H. (1998) Training and Overtraining: An Introduction. Medicine and Science in Sports and Exercise, 30(7), pp.1137-1139. Rowbottom, D.G., Keast, D. & Morton, A.R. (1998) Monitoring and Preventing of Overreaching and Overtraining in Endurance Athletes. In R.B. Kreider, A.C. Fry, & M.L. O’Toole (eds.). Overtraining in Sport. Champaign, IL: Human Kinetics, pp.47-66. Fry, A.C. & Kraemer, W.J. (1997) Resistance Exercise Overtraining and Overreaching: Neuroendocrine Responses. Sports Medicine. 23, pp.106-129. Kreider, R.B., Fry, A.C. & O’Toole, M.L. (1998) Overtraining in Sport: terms, definitions, and prevalence. In R.B. Kreider, A.C. Fry, & M.L. O’Toole (eds.). Overtraining in Sport, Champaign, IL: Human Kinetics, pp.vii–ix. Armstrong, L.E. & van Heest, J.L. (2002) The Unknown Mechanism of the Overtraining Syndrome: Clues from Depression and Psychoneuroimmunology. Sports Medicine. 32(3), pp.185-209.